My travel and photography experiences. 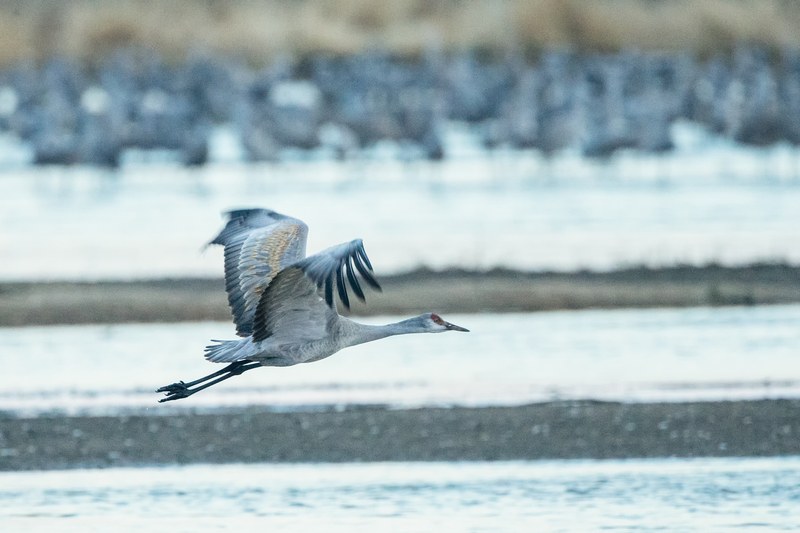 This past weekend, March 25 and 26th, I was near Kearney, Nebraska at the Iain Nicholson Audubon Center at Rowe Sanctuary photographing Sandhill Cranes. About five years ago I went to Bosque del Apache National Wildlife Refuge south of Albuquerque, NM. 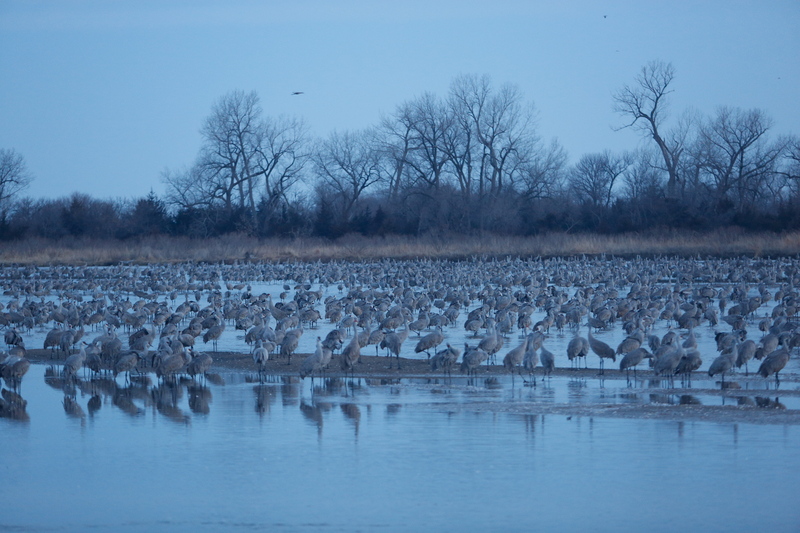 There were about 10,000 Sandhill Cranes and 50,000 snow geese at this location and I thought that was a lot. 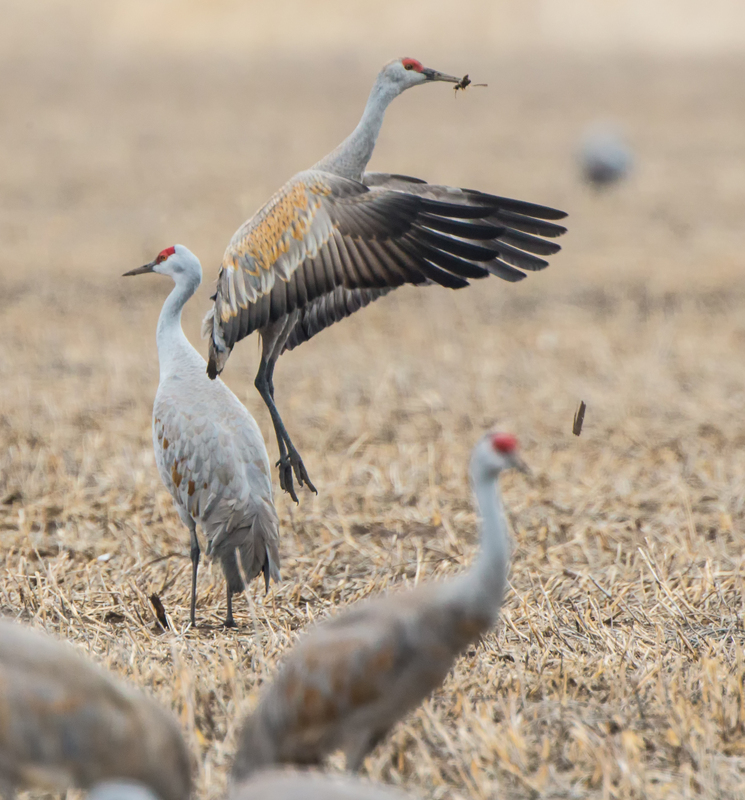 An estimated 500,000 cranes show up each March into early April at the Rowe Sanctuary to refuel for their arduous journey back to their breeding grounds in northern Canada, Alaska and Siberia. During the day, they feed on waste corn in the cropfields near the Platte River. 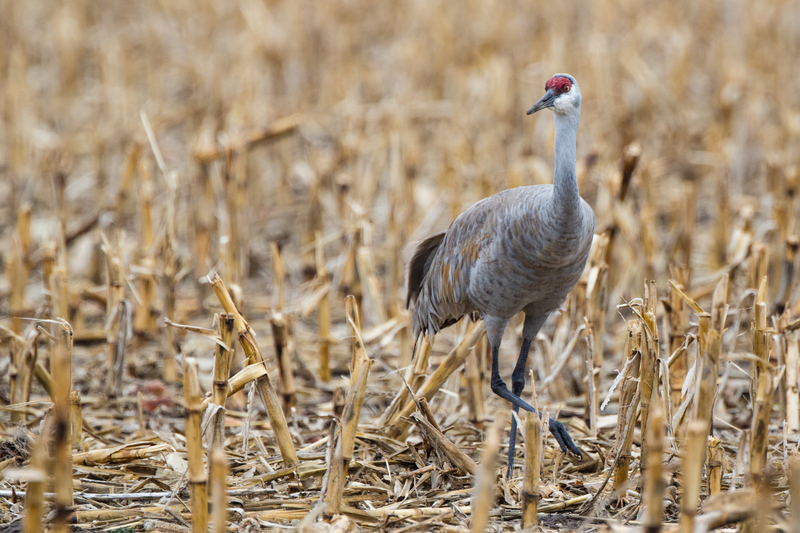 Many of the farmers in the area leave excess waste corn in the fields for the cranes benefit. They also use their sharp bills to probe for insects under the surface. I drove around the area most of Monday making images of the cranes as they spent their day in the fields. They are very skittish since they are hunted in seven states and are wary of anyone who stops near the edge of the fields. 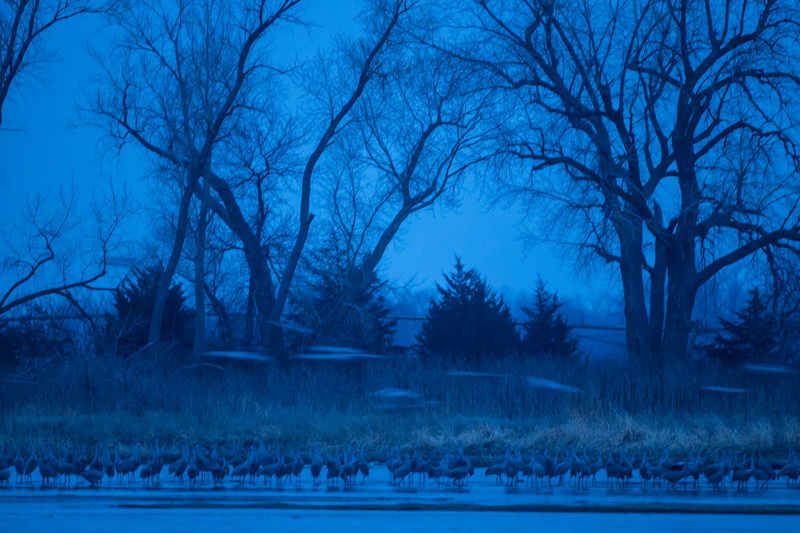 At night, the cranes move to the Platte River to get away from potential predators. I had reserved one of four blinds on the banks of the river for Monday night. This was a blind about 30 yards from the one I occupied. It’s big enough, they say, for two people but it seemed pretty crowded with just me in the one I had. The blinds are 7′ high x 8′ long x 6′ deep. It has four wooded window openings, two on the front and one on each end. They are basically your neighborhood garden shed. The rules are quite simple. A guide delivers you to your blind between 4-5pm and they come and get you around 9am the next morning. You are not allowed to leave the blind, nor stick your lens or your head or arms outside the windows. I was in my blind for 17 hours. You bring a couple of sleeping bags and whatever food and water you’d like. No fires or heaters are allowed either. 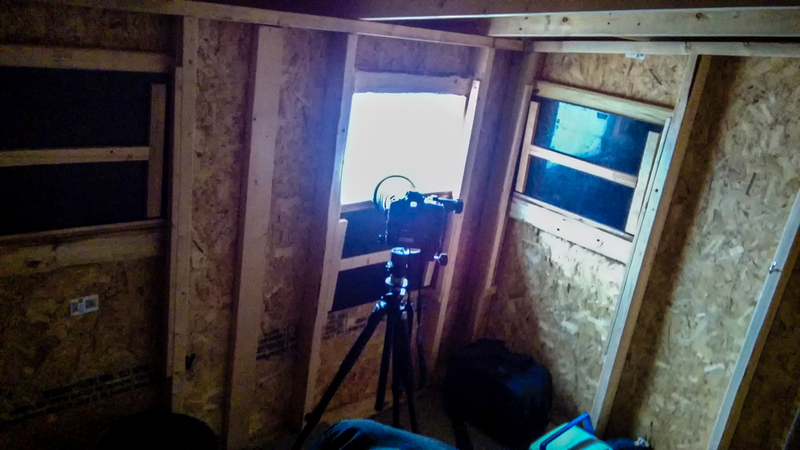 Once I was in the blind at 4:30, I set up my camera gear and began the wait for the cranes to arrive. They don’t have fixed schedule but using show up around dusk. 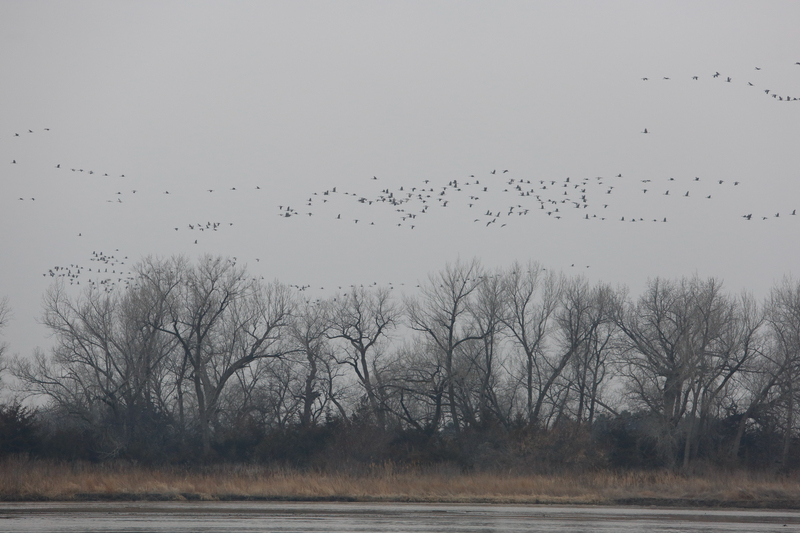 I watched as groups of hundreds and thousands of cranes flew by heading west from my location. 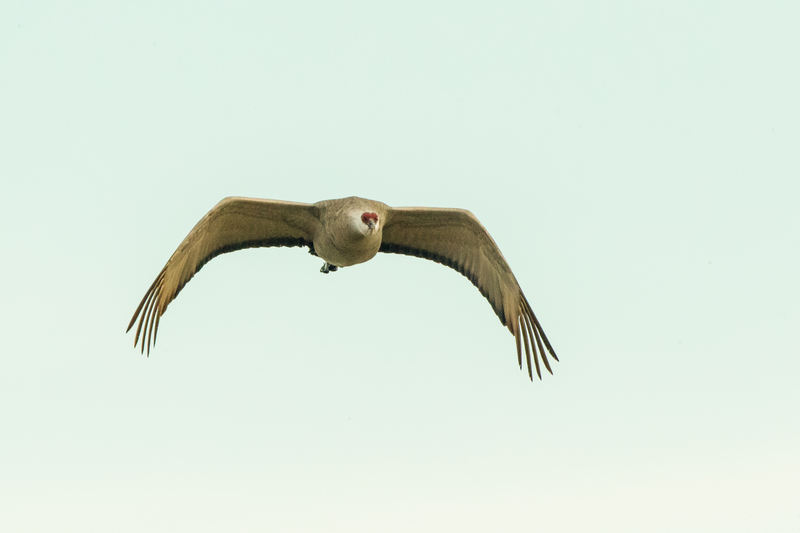 For what seemed like hours, they kept coming….but not landing anywhere near my location. 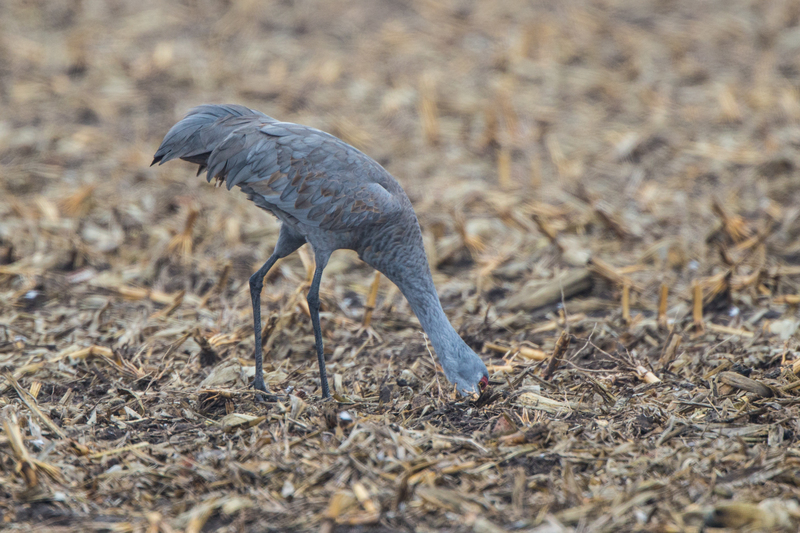 I was beginning to think I had reserved a blind and not a single crane was going to land anywhere near me. Finally, about 8:05pm. At dark, the first group landed across the river from me and then they kept coming and coming. Unfortunately, it was too dark to get many good images. But I knew there would be cranes there in the morning. It was 28 degrees during the overnight Monday. 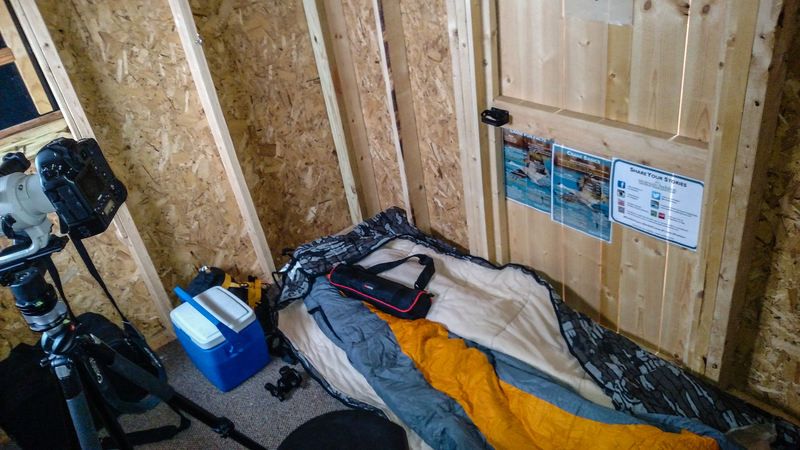 I was comfortably warm with the clothes I had on and my sleeping bags. I hadn’t counted on not being able to sleep due to the squawking of the cranes just outside the blind. I got about 2 hours and at 6:30, I opened the windows facing the river. It was still dark but the birds were getting restless and soon would begin lifting off and heading back to the fields. During the next few hours, small groups of three’s and four’s began to leave. 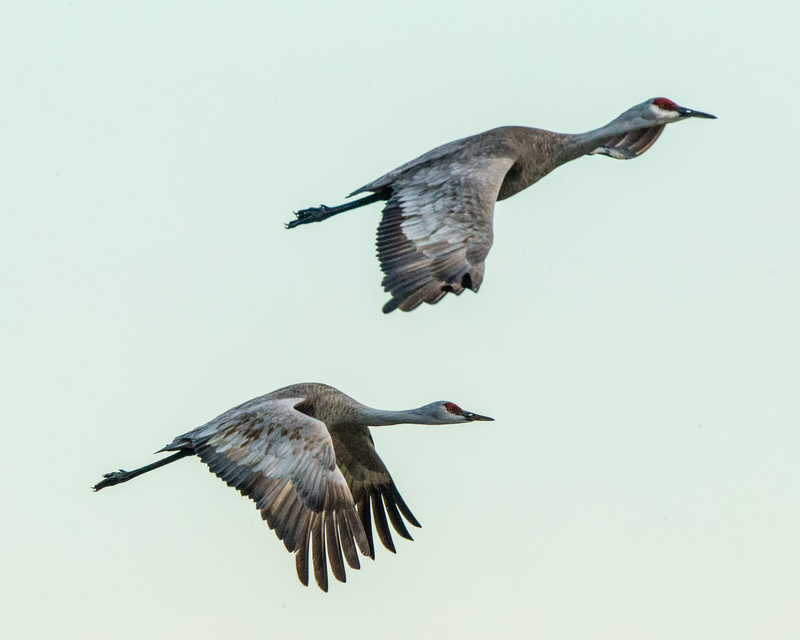 Sandhill cranes are 3-4 feet tall with a wing span of about 6 feet. They weigh 8-12 lbs and live 20-40 years. There are a total of 4 blinds for two people and one larger one for small photo tour groups. Reservations open on January 2. I made mine on January 3. They also do guided tours to larger blinds both in the morning and in the evening for non-photographers and separate tours that last a couple of hours for photographers who don’t want to spend the night in a blind. 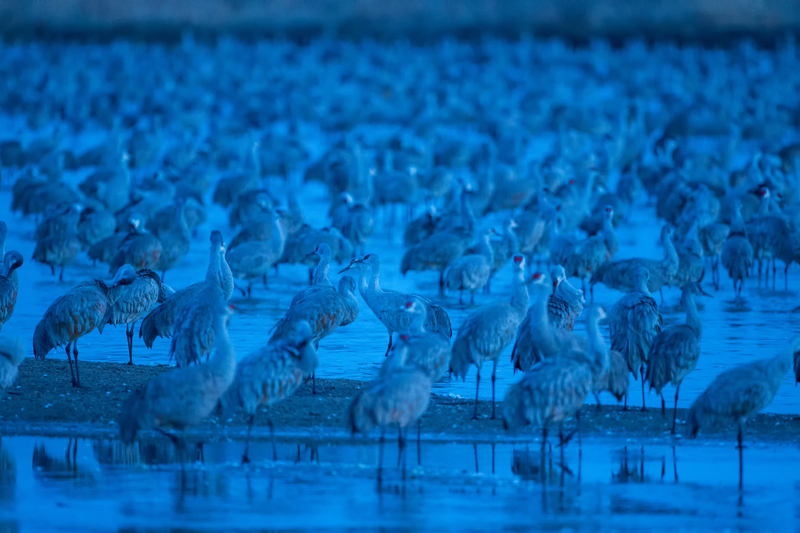 This is the largest gathering of Sandhill cranes in the world. 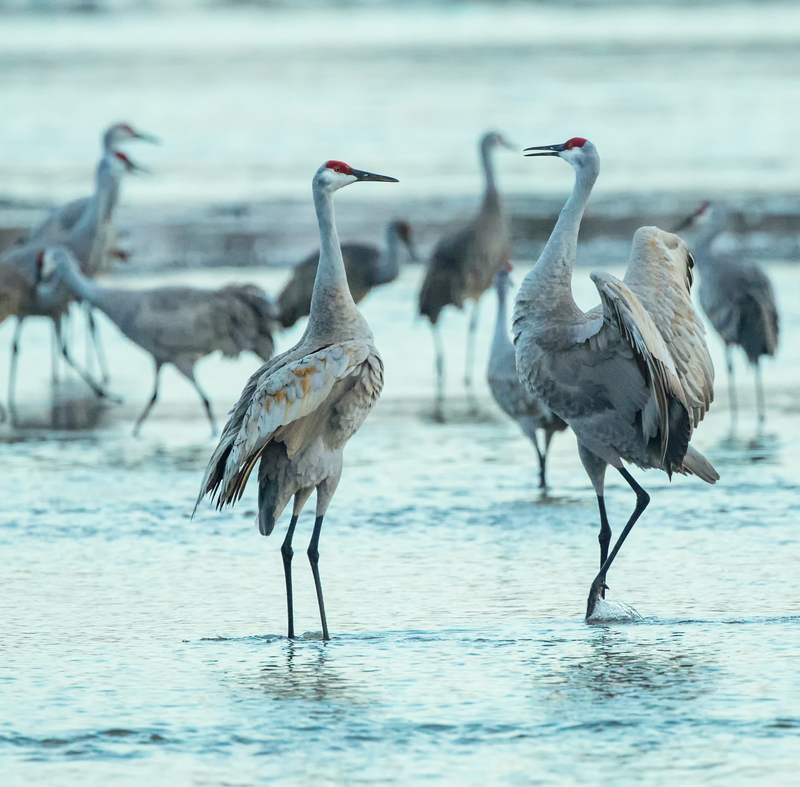 For accessibility, Bosque del Apache in New Mexico is much more conducive for photographers because the cranes that go there are tamer. Photographers line up along the shore there and make images without the many restrictions in place here. 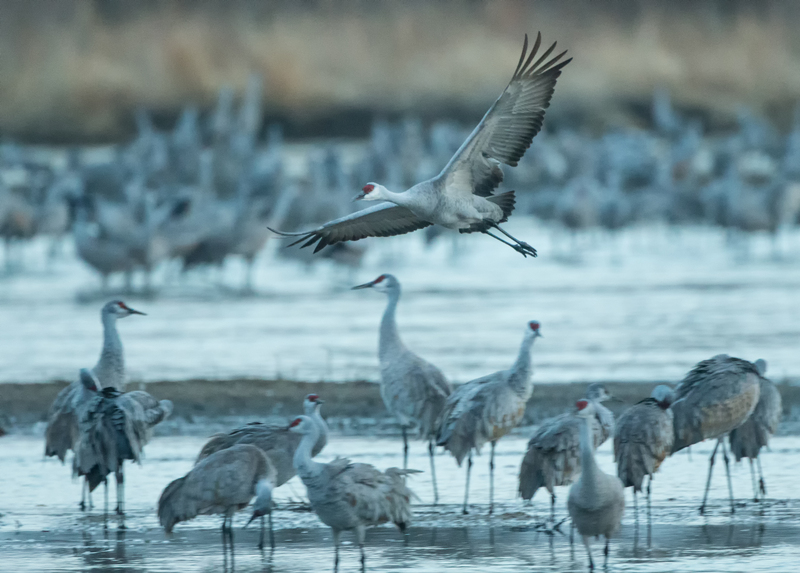 The goal of this sanctuary is to protect the cranes and that’s why they are so restrictive. I don’t consider myself a “birder” but it’s hard not to be impressed by the quantity of birds in one location.